How Virtual Desktops Solution work? 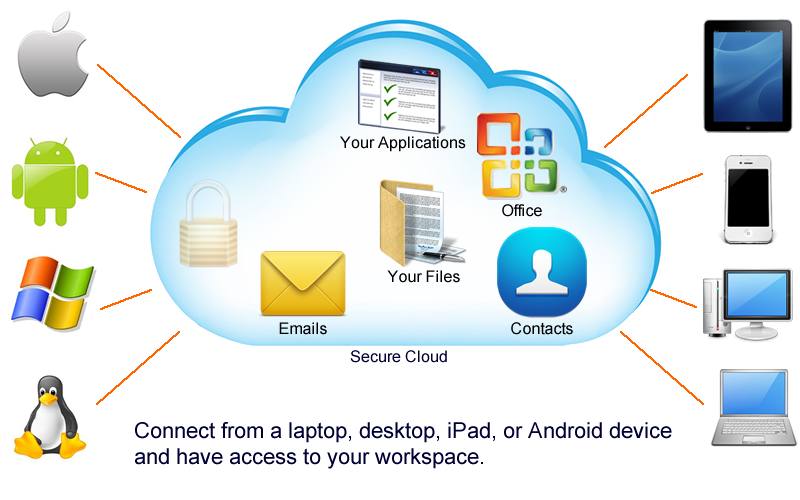 HPC Host's Virtual Desktop Solutions lets you connect from a laptop, desktop, iPad, or Android device and have access to your workspace regardless of where you are connecting from. All of your applications such as Outlook, Microsoft office, QuickBooks and many others are stored and run in your desktop cloud. Your data is stored on a secure, encrypted, and reliable cloud storage system.Your data are stored on a secure, encrypted and reliable cloud storage system. Now, every employee can be productive no matter where they are, and from virtually any device. Whether it is a laptop, desktop, iPad, or Android device - employees can get to their virtual desktop, business applications, and be as productive as they are today in front of their work place desktop. Virtual Desktop Solution's give your business more flexibility. New software can be rolled out quickly, and you can respond to software updates more effectively through a centralized management platform. By migrating to HPC Host's Virtual Desktop Solution, you can extend the life of existing desktops, postpone large capital expenditures or reduce the cost of high end devices. You will also see a significant savings in your operating expense, between 30-50%. HPC Host provides complete security for your desktop. Access to the hosted desktop is encrypted and protected so only your organization can access it. Also the hosted desktops storage is encrypted making the solutions compliant with many regulations including but not limited to HIPAA. Rest assured that your data is safe and accessible anytime with our High Availability cloud protecting you from any hardware failures. Complete this form to speak with a Virtual Desktop expert!